Well, there it is! The bread recipe from the website that I posted earlier is delicous. I need to work on the technique a little, I thought that the bread would puff up around the egg as it was baking, but it didn’t. You need to really snuggle the egg in the bread from the start. I added the glaze, just confectioners sugar, butter and milk. Also, these breads are tiny little individuals – the ones my Grandma Jenni used to make were larger, and she nested 3 eggs in one loaf. I will try it that way next time! Am I dreaming?? My Jeremiah Froggy Reflection shot earned 1st place in The Wild Weekly Photo Challenge: Reflections!! I can’t believe it, I thought for sure I wouldn’t even get an honorable mention this time around, all the entries were so GREAT! And take a moment to look at all the entries, they are stunning !! And I made them myself, LOL no store bought Easter Eggs for me! My hardboiled eggs, waiting for the easter egg treatment. I put them in the colander to cool, and I noticed the pretty shadows! 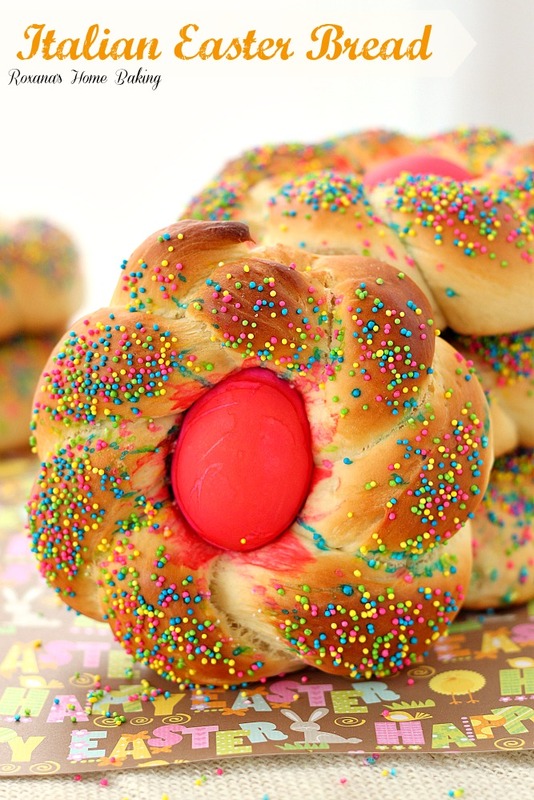 My Italian grandmother Jenni used to make Easter Bread every Easter – I was always fascinated by the colored egg in the bread! I have never tried to make it myself, but I’m going to take the plunge this year, wish me luck! My Grandfather Anthony came from Deliceto, Italy. Anthony and Sam (brothers) married Jenni and Julia (sisters)! My Grandmother Jenni had 6 children, and 3 of those children ~ Antoinette, Francis and Angela (my mom) each had 6 children!